Estes Park is one of the most beautiful mountain retreats in all of Colorado — and we’re not just saying that because they’re our neighbors! OutThere Colorado named the village on their list of the 10 Most Beautiful Places to Spend a Weekend in Colorado. It was chosen for its proximity to Rocky Mountain National Park and the stunning views from Estes Park Aerial Tramway. Whether you’re visiting for the views or the outdoor recreation opportunities, you’ll also find a charming village atmosphere, boutique shops and delicious local eateries, breweries and distilleries throughout Downtown Estes Park. In short, there is plenty to love about this Northern Colorado town and we definitely recommend a trip. Below, we’ve rounded up the lodges and cabins that will enhance your visit. Each one offers the amenities and the settings that will inspire you to call Estes Park your second home. Catering to couples and perfect for honeymoons or weekend getaways, each cabin at Annie’s Mountain Retreat has its own private, outdoor hot tub. Just three miles from Estes Park, three of the buildings are located along the Big Thompson River with water access, and the fourth borders Rocky Mountain National Park with access to hiking trails just steps away! Nestled on 22 acres of private land in the heart of Big Thompson Canyon, this sought-after cabin is just minutes from Rocky Mountain National Park. But with a mountainside pool, sauna, hot tub and game room, you may not want to leave! 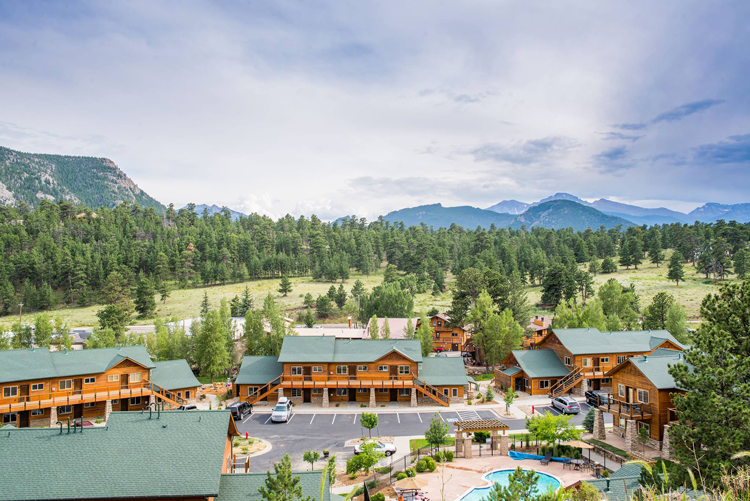 Now part of the Estes Park Condos family, Black Canyon Inn offers privately owned condos and a stunning log cabin — all located off of the beaten path but still within Estes Park. Max occupancy options range from two guests in the secluded Columbine Cabin all the way up to ten guests in other lodges. See all of them here and enjoy jaw-dropping photos and views before you arrive! Nestled below towering pine trees along the scenic Fall River, Boulder Brook offers romantic spa suites, one bedroom suites and lodgings that can accommodate your whole family. Many of these also feature views of the river and local wildlife as well as private hot tubs and spa amenities! See them all here. Castle Mountain Lodge got its start in the late 1950s and became the first new cottage to be built and rented annually. Soon after the first building was built, five more cottages were constructed. Today, the dog-friendly lodgings feature one-bedroom, two-bedroom and three-bedroom options and include access to the public hot tub, rooms with private, indoor hot tubs and rooms with private, outdoor hot tubs. Get all the details and make your reservation online here. 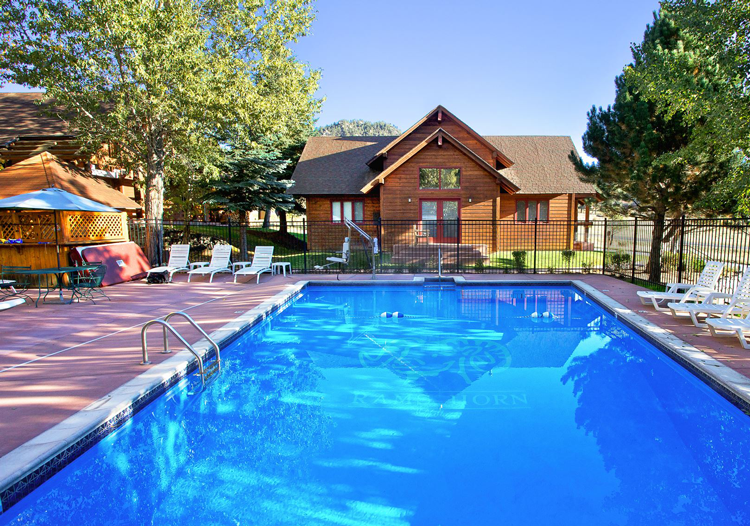 Complete with grills, fireplaces and an outdoor hot tub, Colorado Cottage is a family-owned and operated resort of 12 individual and duplex cottages nestled in a quiet courtyard setting on one acre. The grounds and cabins offer immaculate views of the Rocky Mountains as well as free WiFi and a dog-friendly environment. Just a 5-minute stroll from downtown Estes Park, Fall River Village offers 66 luxury accommodations, including 60 two bedroom and two bathroom condos, a honeymoon suite, four three bedroom and four bathroom townhomes and a four bedroom townhome with panoramic views of the Continental Divide. Property amenities include a heated, outdoor pool, year-round, outdoor hot tubs, a community room, fire pit and grill areas as well as an outdoor recreation area with yard games and a hammock. 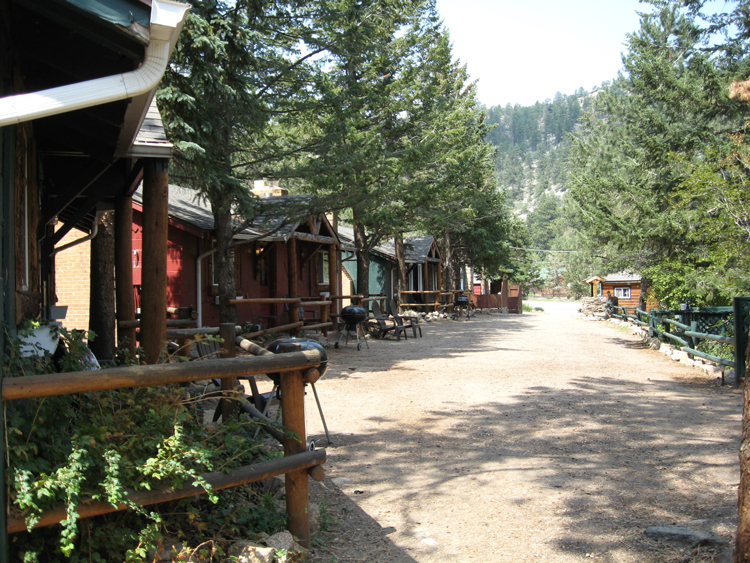 Nestled along the Fall River, Murphy’s River Lodge is located only two blocks from the historic downtown area of Estes Park. Completely remodeled lodgings include 13 rooms, rooms with private decks, a second property Murphy’s Resort and six fully-furnished vacation home rentals in Estes Park. These single family home rentals include access to River Lodge or Resort amenities including the pools and hot tubs! Located one mile from the main entrance of Rocky Mountain National Park and two miles from Estes Park, Rams Horn Village Resort offers 46 luxury cabins, a heated outdoor swimming pool in the summer, three outdoor, year-round hot tubs, a fitness center and a playground on over seven acres of landscaped grounds. Every amenity at Rams Horn is free to use with your reservation and every cabin will turn into a second home. Owners Wendye Sykes and Shelley Powers came to Estes Park from San Francisco looking for an escape from the grind of everyday city life — and that’s exactly what they’ve created at River Spruce. Offering nine different cabins, you’ll find lodgings suitable for couples and families all nestled amidst the scenic Rocky Mountain wilderness and along the Big Thompson River. Nestled just one mile from the south entrance of Rocky Mountain National Park and two miles from downtown Estes Park, Rockmount Cottages is a 20 cabin resort covering 15 acres of wilderness. On the grounds, you’ll have access to a half mile of the Big Thompson River available for fishing and riverside picnics. To fit the lodge lifestyle, each cabin is constructed of knotty pine and most include cozy, stone fireplaces as well as furnished kitchens, a 40-inch flatscreen and DirecTV, wireless internet, and outdoor charcoal grills and picnic areas. The land that now houses the cozy Rustic River Cabins was originally declared a homestead of 160 acres in the Big Thompson Canyon in 1903. Through a series of owners, name changes and new buildings, it became Rustic River Cabins in 2003 and now has seven all-season, pet-friendly cabins which sleep between two and eight guests and feature a fireplace, a full kitchen and private hot tubs in five. They were originally built in the mid-1940s and offer a cozy charm that’s perfectly suited for a mountain getaway. This hotel resort offers seven beautiful locations with 125 units to choose from. Whether you’re staying in the dog-friendly Timber Creek Chalet or in one of the luxurious vacation home options, you’re in for an award-winning hospitality experience. See all the lodging options here and choose your mountain getaway! Just a 5-minute walk from Lake Estes, Solitude Cabins is a four-season retreat home to several fully furnished, lodge-style, private Estes Park vacation rentals. Each cabin boasts a full kitchen, a patio with a gas grill and furniture, a full sized washer and dryer, jetted tubs and more. Three miles west of Estes Park, Valhalla Resort is nestled on 15 secluded acres with 25 cabins ranging from small, one-bedroom homes to large, four-bedroom rentals. All are equipped with full kitchens, fireplaces, cable TV and private decks and the grounds boast mini-golf, basketball, volleyball and an outdoor heated pool! In the comments below, let us know if you have a go-to getaway in Estes Park!